By default MongoDB stores data inside data folder of C Drive. You need to explicitly create this folder as well. You will get a solution when you download MongoDB for CSharp from here . Open the solution in Visual Studio and build it. Take MongoDB.dll and add this reference to your project. For purpose of this blog post, I am going to create a console application. I have added MongoDB.dll as reference in console application project. 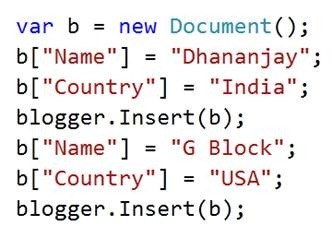 Above code will connect to MongoDB and create a database called Bloggers, if it does not exist. To fetch a particular document or record you need to create document and provide key value as below. FindOne() function returns a document . You need to call Get function with key value as input to fetch the value. In this way you can perform operations on MongoDB using CSharp. I hope this post is useful. Thanks for reading. i was searching the forum for a utility/script, which can catch real time stock quotes from an open excel file and feed it to charting software, Amibroker. I read your post in other forum about reading realtime data from excel, but i dont have programing skills, so i cant understand much. Just an FYI: the driver you have pointed to and subsequently used is extremely old and outdated (it isn’t even the newest version of that driver either). The official driver at https://github.com/mongodb/mongo-csharp-driver. Alternatively, it is available on nuget at http://www.nuget.org/packages/mongocsharpdriver.